I’ve been slow to post my final group of pictures from this event. Sorry! 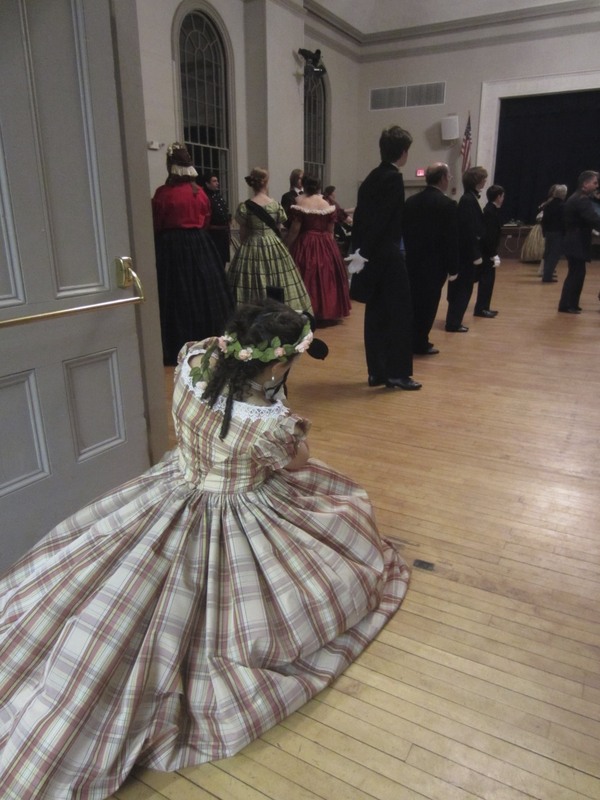 You’ll remember that I first posted Three Series of Photos of my new green 1864 ball gown, Evie, and her undergarments? Then I posted A Second Series of Photos of friends? 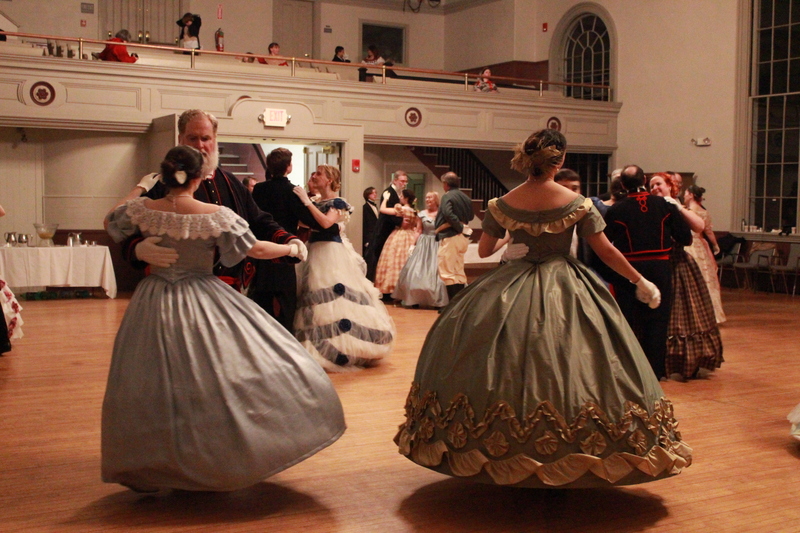 It’s finally time for the final installment of posts from the Commonwealth Vintage Dancers’ Returning Heroes Ball back in March. 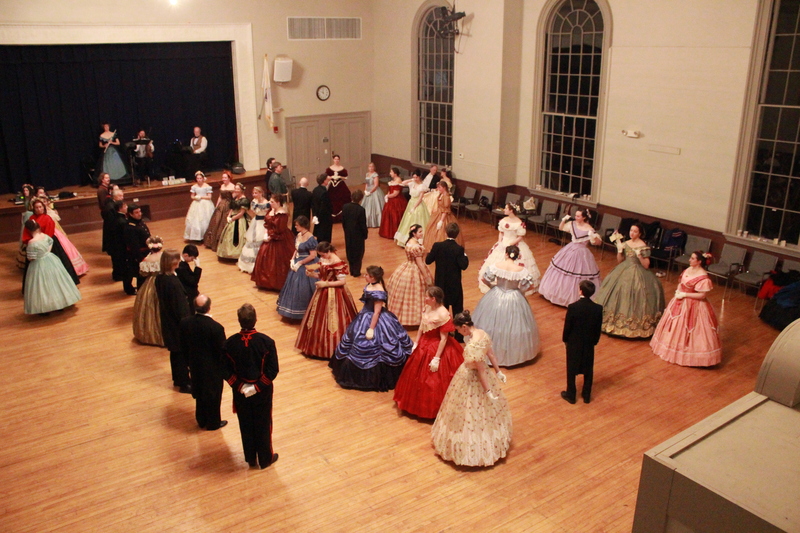 A ballroom full of hoop skirted ladies and suited gentlemen. A lovely set of dancers. 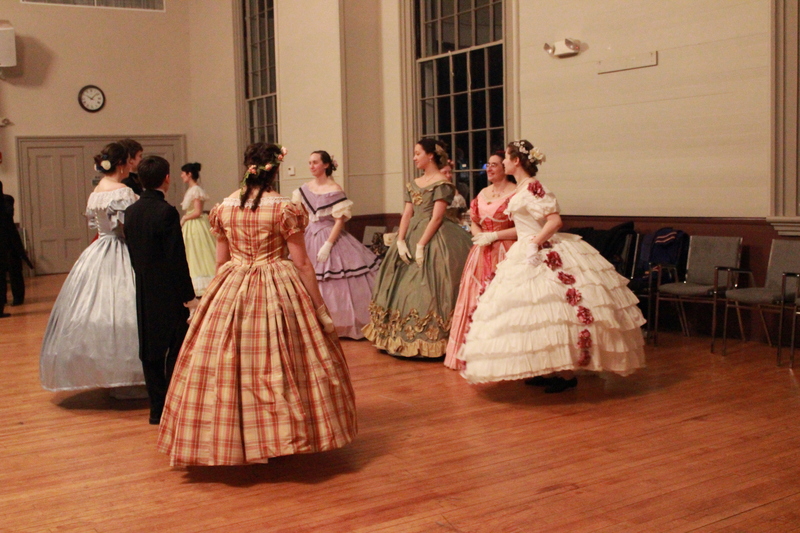 Don’t we all look nice in our light colored dresses? 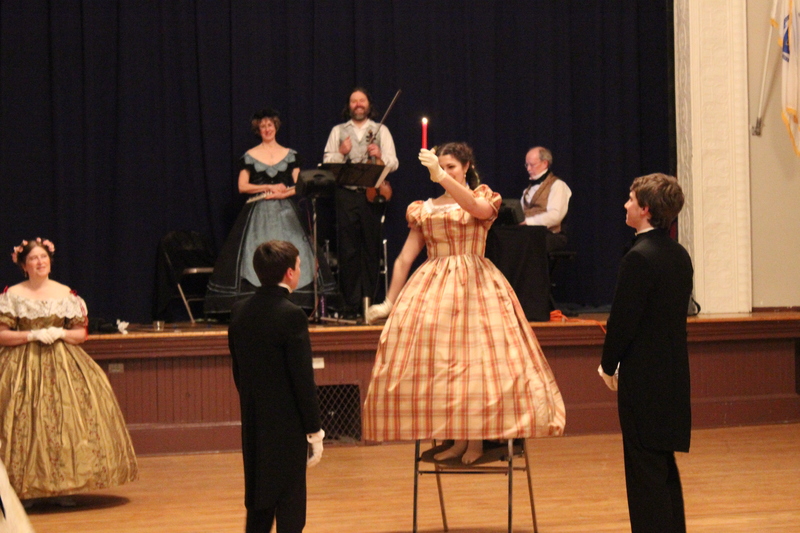 A “German Cotillion” dance game during intermission, in which the two young men vied for the young lady holding the candle, each trying to blow it out first. Whoever blew it out was rewarded with a waltz. Do The Jellyfish! There are more Jellyfish pictures from Ochre Court last year. 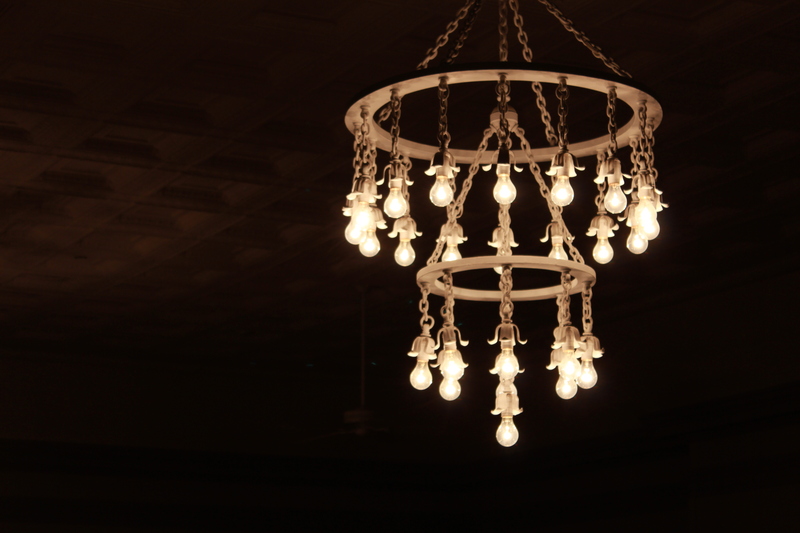 The chandelier is perhaps not the loveliest style, but I like the artsy style of the photo. The coffered ceiling is great! 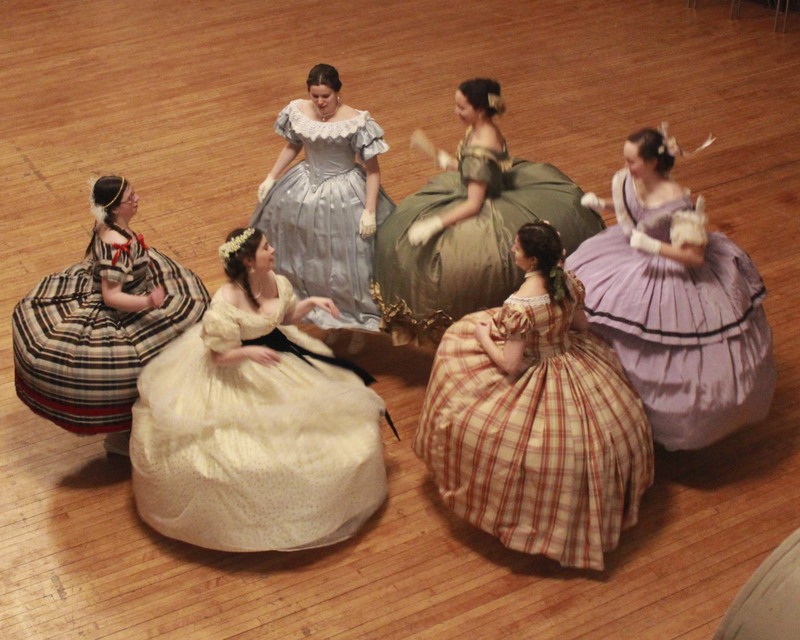 Gallery | This entry was posted in 1860s, 19th Century, Galleries, Hoops and Bustles, Project Journal: 1864 Ball Gown, Victorian Clothing, Vintage Dancing: 19th Century, Wearing Reproduction Clothing and tagged 1860s, 19th Century, American Civil War, Ball gown, Clothing, Crinoline, Historic Clothing, Silk, Victorian, Vintage Dance, Women's Clothing. Bookmark the permalink. I had a huge smile on my face as I read this and looked at the photos. 🙂 What fun it must have been! Oh good! I’m so glad to hear about your smile! The layers of trim came out amazing. The look is stunning. I just love that you included some German Cottillion games. There are so many fun ones to try. Thanks! 🙂 Germans are super fun and silly. 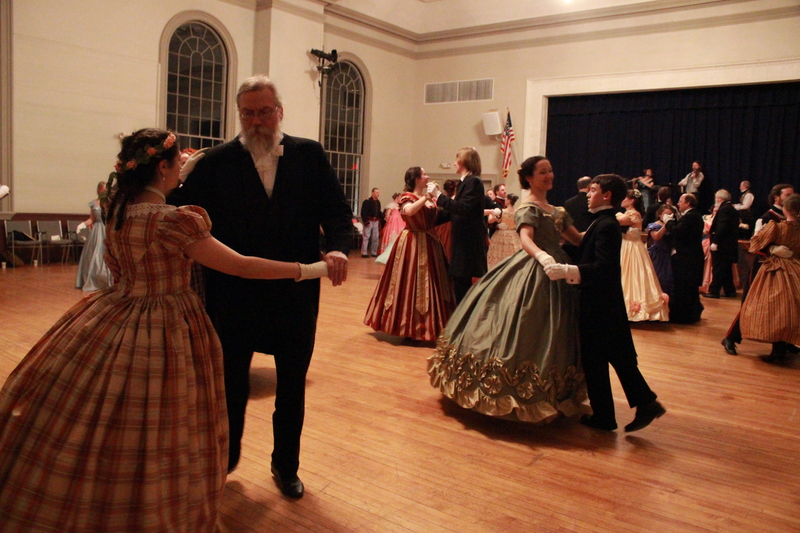 We try to throw them into events when we can and hope to one day have an all night German Cotillion event!